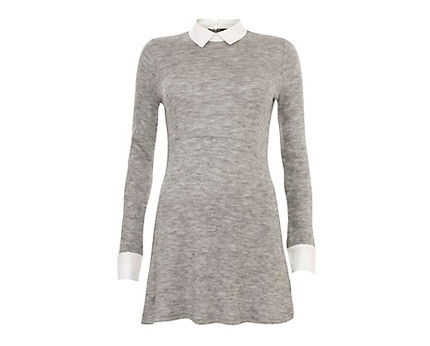 This jumper and shirt dress is a great way of getting the best of both! Two styles incorporated into one offering maximum effort in the style stakes yet minimal time it takes to get ready, bonus! Ideal for work or play, this design is incredibly trendy right now and super cute on the eye! This design features a soft knit for added comfort which is panelled for a more figure flattering result! The contrasting white shirt looks super cool teamed against the grey and black, and it is attached to this dress for your convenience – only showcasing the cute collar and cuffs for ultimate impact! A concealed back zip completes this stylish design! This incredibly stylish shirt dress is a staple look for this season; it’s a great office look or can be worn anywhere during the day or for holidays. It offers a stylish result with minimal effort and it incorporates all the latest trends for maximum style points this season!